PSX 1001 Range: 3.5 oct (F4-C8). Bars: African Padouk . Bar Sizes: 40x23 mm . Pitch: A=442. Layers: Steel. Tripé não incluído. Performing Standard 1000 Series. 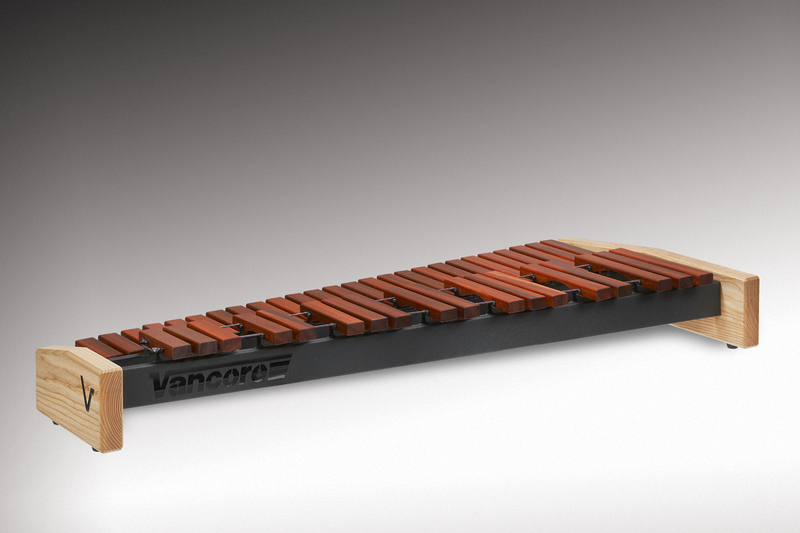 To extend Vancore line of xylophones from an efficient manufacturing standpoint, together with top quality, we designed Vancore Performing Standard 1000 Series xylophones. This beautiful xylophone assembly is equipped with Vancore unique Integrated Cord Suspension System (ICS). Very easy to break down and assemble through snap on rail attachment. Available in 6 different models. Build up set according 2000 series available. A complete series of mallet instruments designed for the budget minded students, orchestras and ensembles. These instruments feature the same select bar materials and carefully handcrafted resonators which are used for the Custom . The frames of these instruments are produced using European Ash wood. The height adjustment on these models can be executed very easily!